Hi everyone and welcome to the Topflight Stamps 1st Birthday Blog Hop!!! I was thrilled to be asked to participate in this exciting event by store owner Donna Bowman and have a new project to share with you as part of these celebrations. Before we get to that here's the lowdown on the Blog Hop itself from Donna: "The past year has been more successful than we ever could have imagined and it’s all because of our amazing customers. We are so excited to celebrate with you and give you our 1st Birthday Special Discount - 20% off ALL orders - use code BDAY20. Topflight Stamps is a place you will find different and unique stamps from around the World. Today we have an AWESOME blog hop with some of the best paper crafters in the industry. They are each featuring some of our favorite stamps. Be sure to comment on this blog and all the blogs on the hop to be eligible for the GRAND PRIZE - a $50 store credit!!! 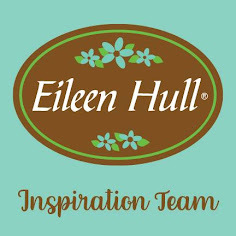 PLUS - each of the designers on this blog hop are giving away a $10 gift certificate to one of the commenters on their post. I will announce my winner here on Monday, April 2. The $50 Grand Prize winner will be announced on the Topflight Stamps Blog the same day." As Topflight Stamps sell a wide range of IndigoBlu designs in the US, Donna asked if I would create something using them to share with you. So here is a card created using the 'Anemone and Daisy' stamp set. I'm sure you'll agree that this 'Anemone and Daisy' stamp set has some beautiful floral images that are perfect for using on your own cards and other projects. You'll find these and many more IndigoBlu designs in store now at Topflight Stamps. 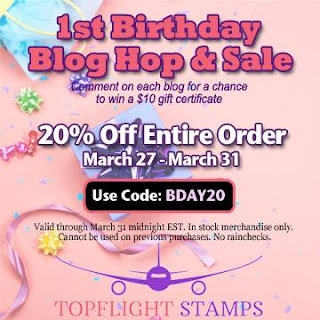 That's it for my contribution to the Topflight Stamps 1st Birthday Blog Hop - now it's time for you to hop on over to see the other wonderful projects. Be sure to comment on this blog to be in with a chance to win a $10 gift certificate. I'll be back to announce the winner on Monday, April 2. Awesome card and love the background you created! Love your background colors plus all the demensions! Great colors - thanks for sharing! Fantastic background and gorgeous stamp. Gorgeous flowers! Love the background you created and the colors you used! Beautiful card! Love, love your awesome card. Beautiful card! I love all the different color variety choices absolutely gorgeous! and I like the dimensions too! Just absolutely stunning and so gorgeous!!! You made me fall in love with this stamp set! I adore the colors you chose and all the layers you created. 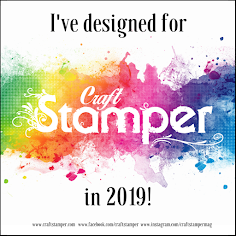 I could also see using these stamps in my art journal, as well as on cards. Just stunning! Happy 1st Birthday to Topflight and thank you for being part of the celebration and hop. I am so enjoying seeing what each of created. WOW.... all the layers to your stunning card. It is very carefully thought out and well presented. I love the way you presented the "anemone and daisy" stamp set. Gorgeous background for these flowers to be on! Love the design and layout. Love the colors...very eye catching. Gorgeous card! Love the rich colors! Amazing card with all the lovely layers and gorgeous colors! I love the colors you used and the dimensionality of the card! Beautiful colors and I like the size card you used! I love the backround with the lovely flowers. Fabulous work! Fabulous use of many materials. Love it. I LOVE this card! ! Gorgeous card! Love how you popped up flowers/greenery. Love it, those are my go to colors. Hey Jenny! 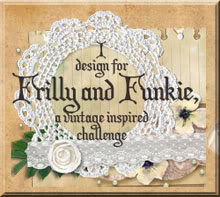 Fabulous card...love the background as much as I do the focal image! You always do such great posts with all of the details. Thanks for the inspiration! What a beautiful card, I love the color combo! oh, i love the colors! your card is just gorgeous! Beautiful, love all the colors that you chose! Your color combination is superb! This card is beautiful Jenny! Thanks for the close ups!!! Today is my birthday and I have so enjoyed looking through your lovely designs. Thanks! Beautiful color use in the background and loved the layering of the die cut flowers -- very stunning card. Wow! That is such a beautiful card!!!! What a great stamp set!!! I don't think of doing long cards. This is splendid. I need to add some to my collection of designs. gorgeous, love the long layout with such an awesome colour selection. Love the way the stripes stretch out the theme. Really really beautiful! You have so many great elements on your card, it looks very complete and finished. The tall design was perfect too!! Thanks for sharing this pretty idea!! Love all the layers and depth. Nice job. this is simply beautiful!.. so pretty!! What a gorgeous card! I adore anything with blues and greens. The flowers look so pretty stamped in green against all that lovely background texture. So many beautiful details to pick out and enjoy in your design. Stunning! Happy 1st Birthday, Topflight! We look forward to celebrating your success for years to come! Nice! Love the blues! Thanks for sharing! I really like how you used green ink instead of the usual black. VERY cool. Your card is a true work of art! I love everything about it! Anemones are one of my favorites too! Your card is so so pretty, I just love the background! Thank you so much for sharing!!! love everything about your card. the colors just grab me. thanks as always for sharing. Love the color scheme you used here! The flowers with the embossing are just gorgeous! Happy Birthday Top Flight.. Lovely work.